Asteroids, Comets and Meteoroids are all debris remaining from the nebula from which solar system formed 4.6 billion years ago. Let’s have some awareness on Asteroids, Comets and Meteoroids in detailed and simplifies terms. 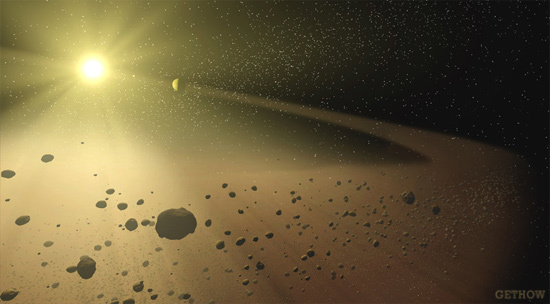 Asteroids are rocky bodies up to about 2,000 Kilometers in diameter, although most are much smaller. Most of them orbit the Sun in the asteroid belt, which lies between the orbits of Mars and Jupiter. Cometary nuclei exist in a huge cloud which is called as Oort Cloud that surrounds the planetary part of the Solar System. They are made of frozen water and dust and are a few kilometers in diameter. Occasionally, a comet is deflected from the Oort Cloud on to a long, elliptical the Sun, the Cometary nucleus starts to vaporize in the heat, producing both a brightly shining coma which is a huge sphere of gas and dust around the nucleus, and by a gas tail and a dust tail. Meteoroids are small chunks of stone or stone and iron, which are fragments of asteroids or comets. Meteoroids range in size from tiny dust particles to object tens of meters across. If a meteoroid enters the Earth’s atmosphere, it is heated by friction and appears as a glowing streak of light called a meteor which is also known as a shooting star in general words. Meteoroids showers occur when the Earth passes through the trail of dust particles left by a comet. Most meteoroids burn up in the atmosphere. The remnants of the few that are large enough to reach the Earth’s surface are termed Meteorites. These are all about Asteroids, Comets and Meteoroids in detail. Thanks Vijesh for leaving a reply here.